Why you should care: Maybe your university hasn’t experienced the blogging traffic plateau yet (it definitely has, btw) but it certainly will. 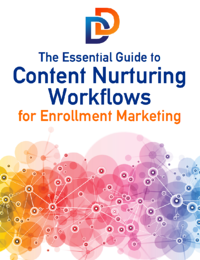 If you’ve ever explored inbound marketing for student recruitment you know it’s all about having awareness, consideration, and decision stage content – and blogging is the perfect for the awareness level, which is meant to be the top of the funnel, so you definitely can’t afford to let that suffer for an extended period of time. FACEBOOK, FACEBOOK, FACEBOOK, IS NOT THE WAY: When it comes to social media, sometimes people are so clueless that they believe everything they hear and just assume that’s the way it is. We’re willing to bet the random tidbits you hear are probably outdated or inaccurate. Here are 4 common misconceptions when it comes to social media, from a trusted source. Why you should care: Don’t be the blind follow of a blind leader. Do your own research, look into new strategies, and form your own thoughts based on data. This doesn’t just apply to social media, but often it’s what gives enrollment managers the toughest time from start to finish. Looking for more assistance with social or want a nudge in the right direction? Shoot us an email at marketing@directdevelopment.com and we’ll get back to you within 24 hours!. SOCIAL IS ALSO WORKING TO HELP YOU: We just talked about how difficult social media seems to many people, but the platforms are also looking to make your life easier whenever they can. Twitter is rolling out a simpler and more engaging way for users to follow certain topics, and even recommend certain tweets in a given topic. This change will also include occasional notifications that will alert users of a popular tweet about a topic they’ve expressed interest in. Why you should care: Having your programs put out content on even a semi-frequent basis will be a great opportunity to become a consistent part of a topic and be a reference point for prospective students browsing Twitter. Your faculty have the thought-leadership so let them right, but make it engaging! Your potential applicants don’t want to read a research paper, but a brief overview of the field and where they can find more info will likely drive much more traffic than whatever’s happening right now.